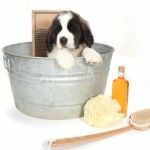 Besides just making your pet look and smell good, grooming provides health benefits. Regular brushing helps remove dead hair, mats, and dirt and distributes natural oils throughout the fur, keeping the coat clean and healthy. Trimming hair around the face, ears, paw pads, and other areas can help prevent infections and irritation and keep debris from accumulating. Trimming nails can improve traction or prevent joint pain, stiffness, and chiropractic problems. Certain breeds—especially those with long hair that mats easily—may need assistance keeping themselves clean. Animals that are older or have physical disabilities may also benefit from our grooming services. If your pet is having trouble taking care of regular grooming, it can be a sign of an underlying health issue. Be sure to mention this when you schedule an appointment. You can also call us anytime to discuss your concerns. During your pet’s grooming session, he or she will receive a bath in specially formulated shampoo tailored to their individual needs, a nail trim, and ear cleaning. We will also check and clean your pet’s eyes, paws, and pads. We know how to keep your pet calm and comfortable during grooming, so if a bath or nail trim is normally stressful, you can let us take care of those responsibilities so you—and your pet—can relax. 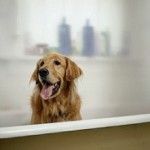 Medicated baths can help ease many skin conditions in your pet. If he or she suffers from dry or flaking skin, infection, or allergies a medicated bath can help alleviate their symptoms. Pets with allergies, flea infestations, and other skin issues may also find relief with a medicated bath. Sarah is our on-site groomer, and she is available Monday – Friday mornings to style any pets that require a more comprehensive grooming or cut. She has an extensive knowledge of dog breeds, their coats, and their unique cuts. You can call the hospital anytime during business hours to schedule an appointment for your pup with Sarah. While we do not offer regular cat grooming services, we do perform baths and sanitary cuts when medically necessary for the health and well-being of our patients. Sedated lion cuts can also be performed when medically necessary. These services are performed by our experienced medical team, but not by a groomer.